This book is a series of translated essays. The points of interest are his discussion of the strong and the weak and the Lord’s supper and the economic/demographic issues tied to each one. I had never considered how wealth would impact the availability of eating meat and how that also then impacts the economic and religious function of the meals that these Christians were engaged in. A fictional account of life in Corinth that pulls together biblical, cultural and historical points to help one make sense out of how life in Corinth would have been in Paul’s day. This book has detailed sections on the praying and prophesying women in 1 Corinthians 11 as well as the instruction on silence in 1 Corinthians 14. Keener takes an egalitarian perspective. 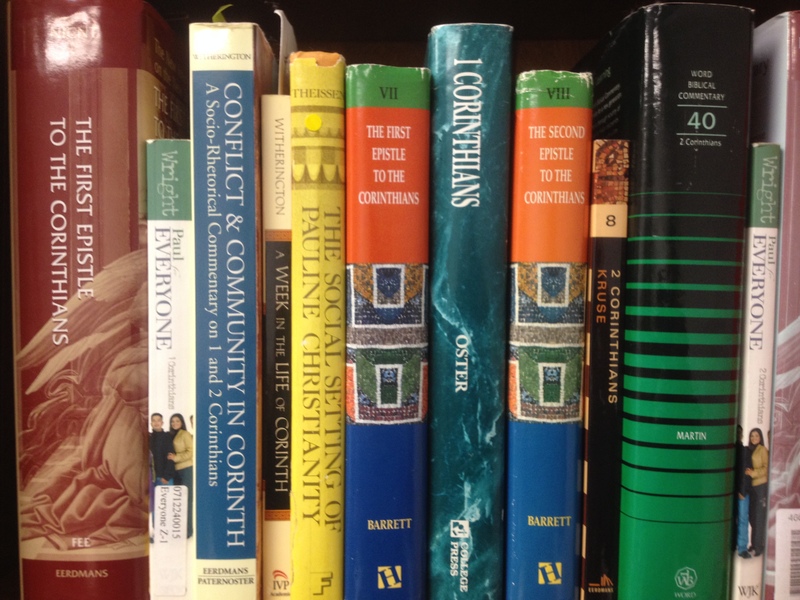 I haven’t ever used this commentary but plan to in my next study of first Corinthians because I have used Barrett’s other commentaries and have found them useful, particularly his commentary on Acts. So I don’t have anything specific to say aside from I trust his ability and insight as it has been helpful to me in the past. Dr. Oster teaches at Harding School of theology so this is your main choice if you are looking for a commentary from a Restoration Movement perspective. This is a very helpful commentary that I have used on numerous occasions. I highly recommend it as Witherington is very skilled at giving you the running flow of Paul’s rhetoric/argumentation in order for you to see how he makes his theological arguments. Along with that, this book gives ample historical and cultural backgrounds to help you understand the text. Wright’s “For Everyone” series has been particularly helpful to me. Wright starts off each section with a personal story that illustrates the point of the text. As always, these “for everyone” commentaries are small, easy to read and help make the complex fairly simple.